TWO banks, a car rental firm, a pizza company, a rugby team, school playground equipment, a Christmas German market, a wallpaper design. All different, all in the United Kingdom and all making money from using the images of Indigenous peoples of North America. 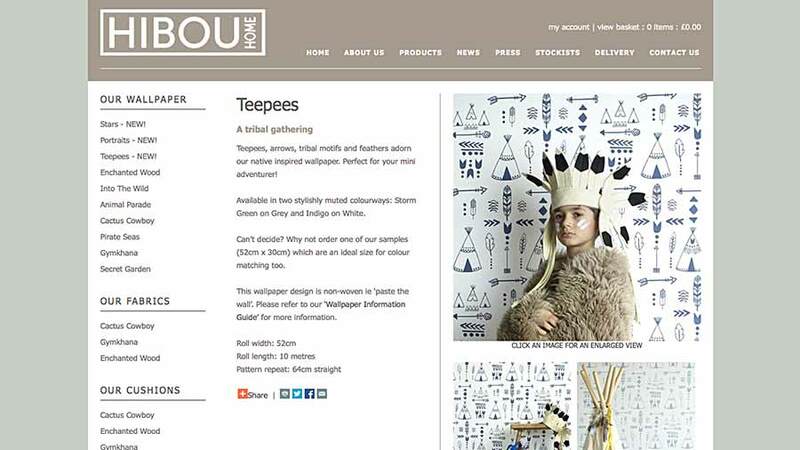 Tomorrow has collected more than a dozen examples of advertising and products using tipis, feathered headdresses or other aspects to make money. Banks, at least one of which helped fund the expansion and claiming of Canadian lands and is now 70 per cent owned by the British taxpayer, use children “playing Indian” to promote their products and services. Sports teams have made millions off the back of Indigenous names and logos. One has dropped the most offensive term, recognising its “negative or divisive connotations”. UK branches of major US firms use Indigenous stereotypes to sell business from car rentals to pizza. Education programmes, schools and teachers can be found mainstreaming the “Doctrine of Discovery”, cultural appropriation and even potentially illegal mockery of Indigenous peoples. And far-right groups and politicians continue to use similar images and ‎narratives about Indigenous North America to promote racist anti-immigrant policies, mirroring Nazi Germany. Why is Indigenous imagery so popular for commercial ventures? Why is it more acceptable in the UK? And what role do consumers have in the future of relations with peoples first colonised generations ago and still suffering and dying as a result today? In March 2015, a press release trumpeted the latest design from Hibou Home, a wallpaper and fabric firm based in the south-east corner of England. 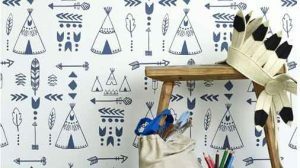 “Teepee wallpaper” from Hibou Home sells for £70 per roll. Screen grab of website. 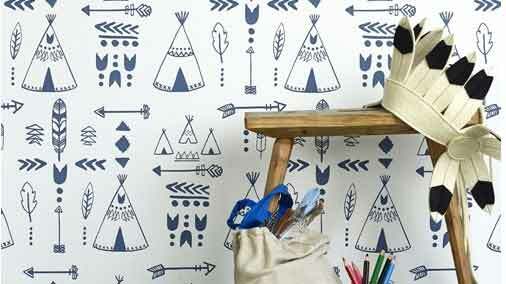 Chelsea Vowel’s first reaction to the tipi wallpaper was, “I want it”, followed by “Ugh”. “As Indigenous people, we don’t get to really go out to a store and buy products that represent us in any way,” Ms Vowel told Tomorrow by phone. “And so, unfortunately, we’re stuck with whatever’s out there, the representations that do exist. They’re few and far between, they’re almost always very stereotypical but it’s at least making some sort of nod to my existence. “And it’s the same thing when looking at buying toys or anything like that. You see a little figurine dressed up as a Native – it’s so rare to see yourself represented that way – that even when you cringe away from it because the portrayal is so awful, part of you is still like, ‘Yeah but it’s still for me’. “So it’s this very conflicting thing. It’s really just rooted in wanting to see more actual representation, for me, for my kids. Hibou Home did not reply to repeated requests for comment. Ms Vowel said the stereotypes rooted in fictional views of Plains culture are so widespread that even if an Indigenous artist made them, she would be uncomfortable. “It’s still filling that niche market of the stereotypical Plains Indian,” she explained. “Even if you have a Plains Indian doing it, it’s still just really appealing to that aesthetic. And that is really unfortunate for me because I come from a Plains culture – this is my culture – and so I feel I don’t have the opportunity to celebrate the symbols of my culture because they’ve so been over-exploited, they’ve so been used to homogenise very, very diverse Indigenous cultures. Canada has more than 600 distinct Indigenous nations and at least 50 languages,6 while the US borders contain another 566 “tribal entities” as designated by the US government, and more than 150 languages7 repeatedly suppressed or criminalised and struggling to survive today. Only a handful of nations traditionally used tipis compared to other housing and ceremonial structures. Artist Shelley Niro8 lives on the Six Nations of the Grand River territory in Ontario. She said examples such as the wallpaper are using child themes to make racism okay. But it could be used positively for learning. “They’re cartoon images representing another nation and I don’t think we would be able to show those in Canada without some kind of uproar,” she said. “It seems like the people who are marketing that seem to be a little bit behind the times. But it’s returned to the mainstream, she said, with examples such as Victoria Secret models in very little except headdresses, musician Pharrell Williams pictured in a headdress on the cover of UK Elle magazine, and the annual issue at music festivals,10 where the Indigenous person is an “envelope in which you can put anything you want”. “And I am shocked that it has come back so quick from the 1990s and the 2000s where I feel we were much more switched on about what was appropriate and what wasn’t,” she said. Native ceremonies are run through charity, not profit, said Dr Pratt. And £70 for a roll of wallpaper could pay for weeks of food for a family. “This whole idea that you would take something Native and then make money on it, is so antithetical – it’s like slapping you twice or three times,” she told Tomorrow by phone. “First we have to look at your crummy things you’ve made in a factory, and then you get to make money off of it and then you get go off and la di da. That’s really, really rude to be doing that right now. Hardly limited to wallpaper, appropriation or exploitation of Indigenous culture ranges from TV commercials to school playgrounds. In the example of the wallpaper, the problem is not just the commercial sale of Indigenous imagery, but children playing with the products without knowledge. “I do feel there are levels of outrage,” said Dr Pratt. “In one sense, to me, it’s all outrageous because first of all a tipi is a lodge usually associated with ceremony or a person’s lifestyle and their home and something that is very sacred on a number of levels. “It would be one thing if we were having a day where we were going to study and look at tipis and how to build them and how long it takes to actually put one together. There is a danger there. “But I think the actual dressing up and the use of logos is probably the most outrageous to me, the most shocking display of almost throwing it in your face that you no longer exist, that it doesn’t matter because, ‘You guys are all gone. We can call whatever name we want because no-one’s going to fight back, no-one’s going to say anything’. And names do matter, said Dr Pratt, with an increasing drive to use the real language of the people being referred to. Professor David Garneau12 is head of the visual arts department at the University of Regina as well as being a Métis artist, painter and writer. He previously mounted an exhibition called “Cowboys and Indians (and Métis? )”, adding in representations of Métis to the two-sided stereotypes. He said the tipi wallpaper is a nostalgic part of that tradition he refers to as “white imaginary”. “It belongs to a larger class of things, perhaps where you’ve got non-Indigenous folks who are interested in the Indigenous, usually in a nostalgic or not very direct way,” he explained. “So you’ll see items of clothing or things that reference aboriginal folks from the high plains era of the 19th century or something like that. Prof Garneau said the use of a child playing with a tipi and headdress in a commercial was “probably crossing the line”. “In terms of children’s play, children will do all sorts of things and they don’t mean offence and they’re trying to engage in imaginative play,” he told Tomorrow by phone. “And yes, the responsible person would situate that play in a larger context. And who knows what they’re acting on or what they know. No businesses questioned by Tomorrow about their ads or products for this investigation confirmed any communication with Indigenous individuals or groups. Ms Vowel said within the debate about appropriation, Indigenous peoples get sidelined or simply erased as current voices. “I would remind people that we exist, on the internet, quite a bit,” she said. “There are all sorts of primary sources you can go to, different news organisations, different communities that have launched campaigns to raise awareness about these things. Lots of Native people are speaking for themselves. One of those voices on the internet is activist and artist RJ Jones, 23, a Saulteaux-Cree youth living in Ottawa.14 They have used an arrow in the symbol for a previous podcast, an image that represents them in the Plains nation. In an interview with Tomorrow by Skype, RJ said the examples of wallpaper and other commercial products and depictions in the UK were more likely ignorance than deliberate offensiveness, but all represent misappropriation of culture. It is a Hollywood, simplified view. RJ said the intention of a parent – for example, “I didn’t intend offence” – wouldn’t matter. “I definitely don’t think parents are going to actively go out and teach the kids about what it means,” they explained. “The fact that they purchased the tipi for their kids to play in is already an act of ignorance so that would already tell me that they’re not going to go out of their way to educate them. And to buy that is going to enforce ignorance and a lack of education. “A lot of people are ignorant but in some ways it’s not their fault. But at the same time, when you’re called out on being ignorant, the least you can do is take responsibility and maybe listen and educate yourself. But that doesn’t happen. “And I’ve rarely – battling cultural appropriation online for years – seen anyone just be like, ‘Ok, I did something ignorant, I am sorry, I am going to take the steps to educate myself’. It’s more of a, ‘I didn’t do anything wrong, it’s freedom of speech’ and pulling every excuse out of the hat. What’s lacking in the use of the tipi image may be a sense of history, not only of Britain’s role in colonialism, but also the people who lived in the structures themselves. Mr Frazier said Indigenous symbols and images have been used since the two cultures met hundreds of years ago. And while the tipi might be associated with Indigenous lifestyle, most tribes were out of them by the end of the 19th century. “That’s an image of serenity and home and being able to move freely,” said Mr Frazier, “and it’s an image we don’t get to have anymore as a lifestyle. It was a very holistic lifestyle, and then it was not. “I think some people get upset about seeing tipis in non-Indian hands because they feel victimised by the conqueror, colonialism. We haven’t been able to get away from that trauma long enough. “We’re only about, say, 120 years from the last struggle, but it’s been, for some tribes, 500 years since they were able to practice their culture the way that they have for thousands of years. “A lot of the use of symbols and mascots and logos get Native people uncomfortable because of the trauma, colonialism, misunderstanding, and losing their culture. Some Britons, however, enjoy the tipi lifestyle denied to others. The social media “event” of the 2017 Glastonbury music festival in the UK includes a main image of tipis, one with Chief Red Cloud on the side. Some individuals called out the photo as offensive. But one individual claimed he and his friends living in “Tipi Valley” were not “playing at ‘being Red Indians’”. This self-declared “tipi folk” had been living year round in one for 37 years and had been creating a circle at the Worthy Farm, home to the festival, since the 1970s. He insisted: “We are just trying to live simply, as our own ancestors did for very many thousands of years, in a round house around a central hearth. The tipi is a wonderful dwelling enabling us to do it. Tipi like structures occur in many cultures, though I admit we use a design perfected by Lakotas. But Britain’s sale of Indigenous culture is not limited to the “wonderful tent” at festivals or on wallpaper for upmarket children’s bedrooms. The profiting goes further – and children and education are frequently at the heart of the exploitation.